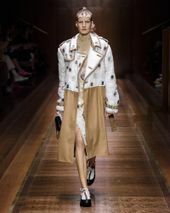 Enter the Burberry Kingdom, it’s a place of opposites and one that chief creative officer Riccardo Tisci is slowly making his own. 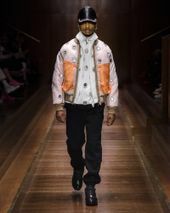 “I’ve been thinking a lot about England as a country of contrasts, from the structured to the rebellious and free, and I wanted to celebrate how these elements coexist,” Tisci said in a statement following his sophomore collection for the heritage British house, which he called “Tempest” after the variations found in British culture and weather. 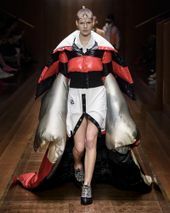 At London’s Tate Modern, two radically different show settings were built. 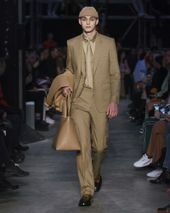 Those with gold invites were seated in a wooden and cream-colored formal theatre; attendees with silver ones were placed in the Tate Tanks’ brutalist hall while a clan of kids wearing tracksuits and hoodies climbed around the steel scaffolding that caged the audience. 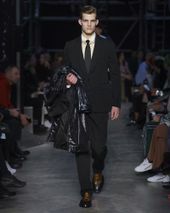 The music, again, was divided into two bespoke soundscapes, the chic room got British grime and rap mixed with news broadcasts and samples of Ali G’s voiceover. 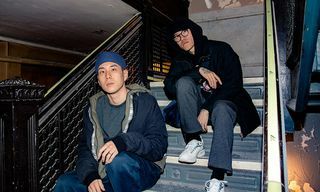 Room street got classical music. 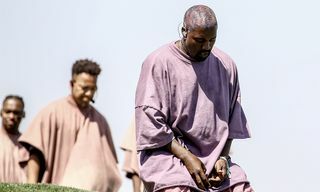 There’s that contrast again. 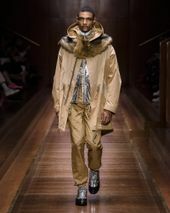 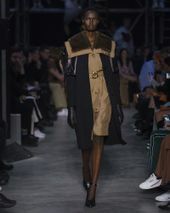 Both were created by Tisci’s friend and collaborator M.I.A., who featured in Burberry’s most recent Christmas campaign. 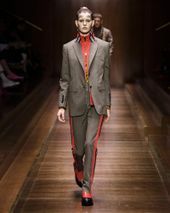 The clothing, too, was sectioned up around the four different characters and customers Burberry is vying after: Girl, Boy, Lady and Gentleman. 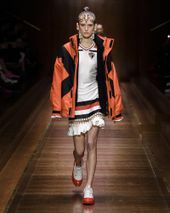 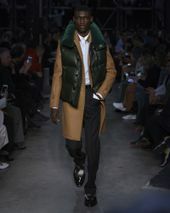 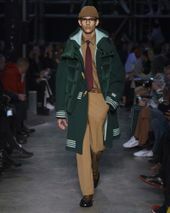 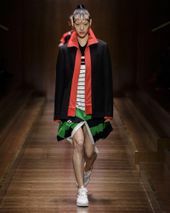 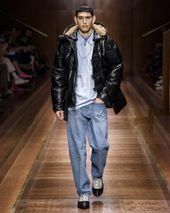 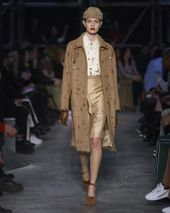 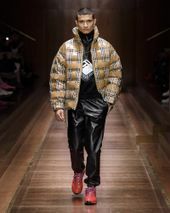 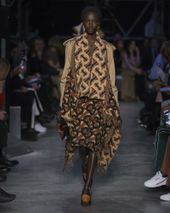 Tisci’s girls were dressed in bright, reconstructed rugby shirts crafted into dresses and skirts; oversized informal polo shirts paired with leather and checked caps; heavy shearling and faux-fur outerwear; luminous technical anoraks worn with lace tennis dresses, glistering earrings, and chunky bedazzled sneakers with rubber oversoles. 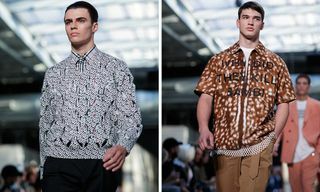 Their boy counterparts were as street-luxe, if not more. 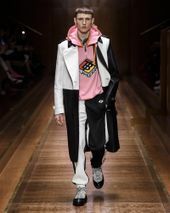 Streetwear staples like tracksuits in plonge leather, graphic hoodies and bombers printed with beer caps, shiny puffer duffles and golden chains were all present. 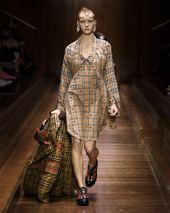 As was Burberry’s signature vintage check, this time reworked in bold patchworks with animal print accents and tape details. 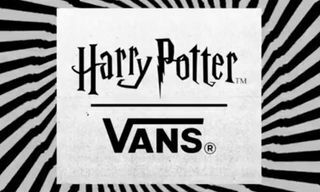 The boys, too, got the oversoled sneakers. 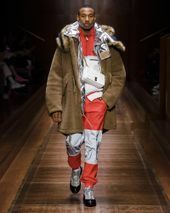 Theirs came in leopard print and metallic variations combined with neoprene socks. 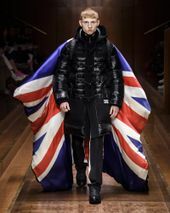 A full black look carried a giant Union Jack parachute-like flag. 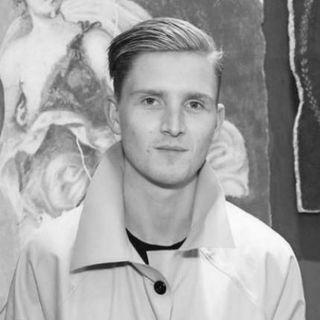 Given the surrounding references, this could either be perceived as a young naive hooligan or a Brexit activist. 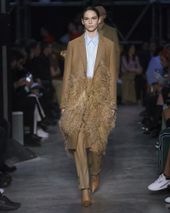 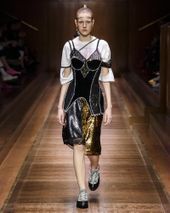 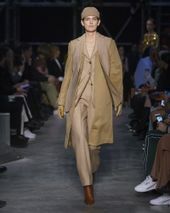 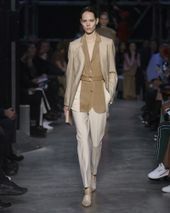 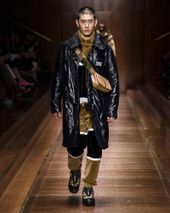 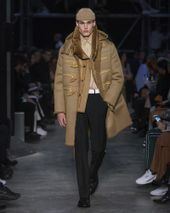 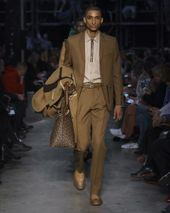 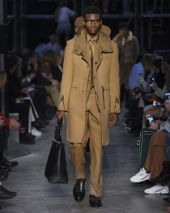 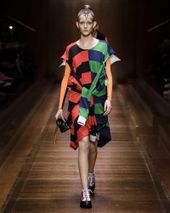 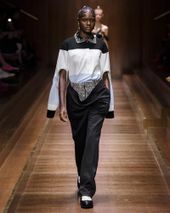 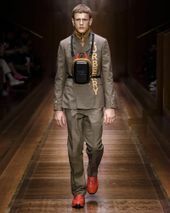 But girls and boys can’t stay young forever, so much like the sequence of Tisci’s debut Burberry collection, the second part of this season’s show was followed by beige formalwear. 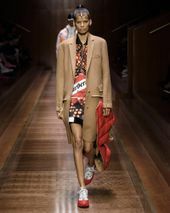 Naturally so, Burberry’s “Lady” was decked out in deconstructed trenches, embellished car coats, draped wool cashmere ponchos and multiple variations of brown, beige and black tailoring, contrasted with bright orange leggings, gloves and other detailing. 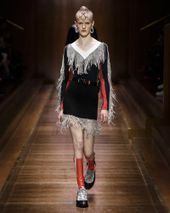 All were worn with pumps, boots and hand-applied crystal fringed kitten heels. 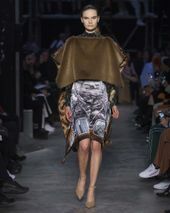 A series of draped evening dresses and new iterations of the TB bag finished the section. 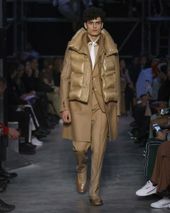 Her Gentleman sported quilted gilets over sharp outerwear, striped wool duffle coats and pleated trousers. 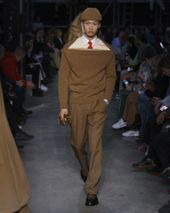 Boat-neck knitwear was reconstructed and worn over shirts that came in silk-jersey. 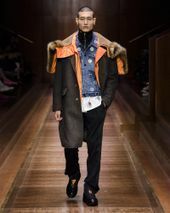 They were shown with rubber-cap-toe brogues and leather Chelsea boots. 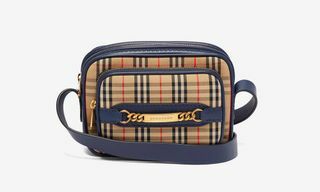 It breathed luxury for the modern man, something kids today will want to wear in 20 years. 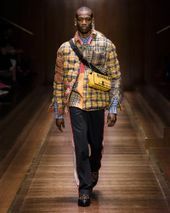 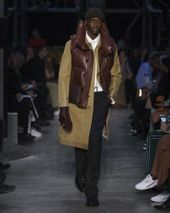 Tisci was Givenchy’s creative director for 12 years, so it made sense that a number of hints to the Parisian megabrand could still be found in his Fall/Winter 2019 collection for Burberry, as seen with his love for the high-low mixing of both his cast and the clothing they wore. 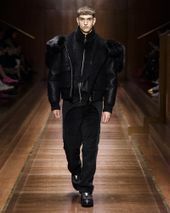 But there were more resemblances. 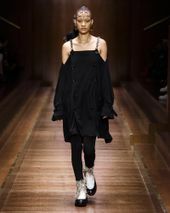 Styling models in oversized and bejeweled facial piercings and curled, baby hairs along the hairline — direct references to chola culture — already got him in trouble once when shown for Givenchy’s “Victorian-chola girl” Fall/Winter 2015 show. 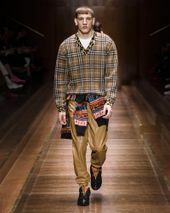 At Burberry the choice remained questionable. 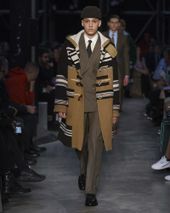 But naturally so, the past will influence the future, so these Tisci-isms are now part of his Burberry world, which is evolving. 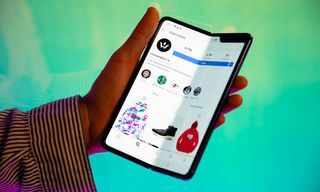 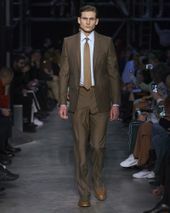 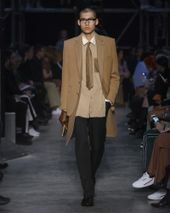 It felt slightly more edited this time around, despite the 106 looks and was a big step forward from his debut collection. 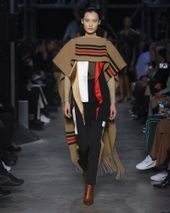 Perhaps it made more sense one season in, following the release of Tisci’s first drops, campaigns and store revamps. 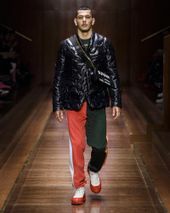 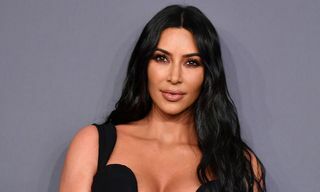 His universe is coming alive or as Tisci put it: “My first season for Burberry was about starting to develop my alphabet for the house, it was about identifying new letters and new codes,” said Tisci. 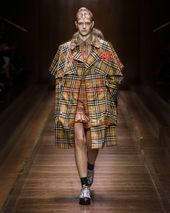 “And now, I’m starting to put these letters together to begin writing my book here, to form the first chapter for a new era at Burberry.